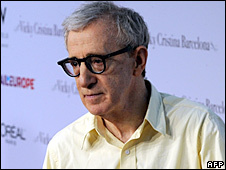 Film-maker Woody Allen has made his debut as an opera director, as the Los Angeles Opera re-interpreted Gianni Schicchi by Giacomo Puccini. Allen treated the one-act production, part of the composer's Il Trittico trio, as an old Italian film. And there was laughter from the audience when the performance began with black-and-white credits being projected on to a movie screen. The 72-year-old did not join the cast and conductor for the curtain call. This was despite prolonged applause at the Dorothy Chandler Pavilion and was because of shyness, the opera company said. The Associated Press' critic Ronald Blum said "more than most opera directors", Allen paid attention "to the small details that make a performance take off". Allen had been persuaded to move into opera by Placido Domingo, the Spanish tenor who is the general director of Los Angeles Opera. As well as Allen's work, director William Friedkin staged Il Tabarro and Suor Angelica, the first two acts in Puccini's trio.